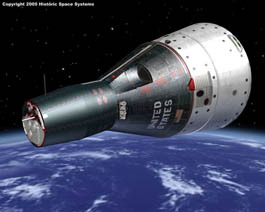 Your visitors pilot the two-man Gemini spacecraft for the first docking in space with the unmanned Agena spacecraft. View movies of the Gemini Docking Simulator. The detailed computer graphics and realistic controls give visitors a feel for flying the real spacecraft. The graphics are superb! Visitors learn how two spacecraft dock in space, essential for future crewed space exploration. Visitors fly the two-man Gemini spacecraft as if they are making the first docking in earth orbit. Interfaces with rotation and translation controllers for full six-axis control of the Gemini spacecraft. The simulation screen gives the viewpoint of the commander in the left seat. 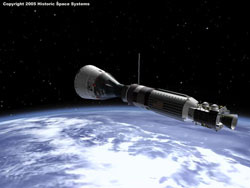 The Agena target vehicle with highly detailed docking system floats outside the hatch window as the earth rotates below. Includes realistic Gemini gauges, as well as a modern Translation Offset display. Bird’s eye view of the Gemini helps orient the visitor. Now formatted for widescreen HD displays. Software design by Historic Space Systems. 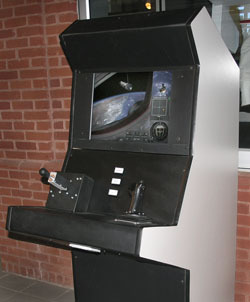 Gemini Docking Simulator housed in a kiosk with translation controller at left and rotation controller at right, designed and built by Historic Space Systems. 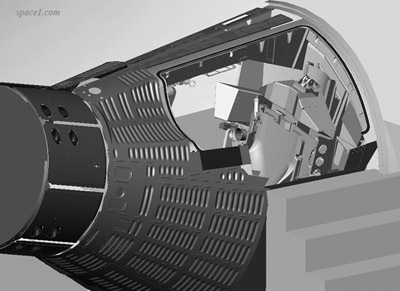 The simulation could also be integrated into a Gemini cockpit enclosure. How Gemini and Agena docked, including historic NASA images. Maneuvers needed to dock two orbiting spacecraft. Use of the controls and gauges to make a successful docking. Level of difficulty selection, and random starting position. Limited time and fuel conspire to challenge the visitor’s docking skills. An instructor astronaut guides the visitor in making the right moves. Legends on the gauges, and changing controller images, help the visitor guide the Gemini. When successful, the visitor is greeted with fanfare and congratulations. If unsuccessful, they are encouraged to try again later. 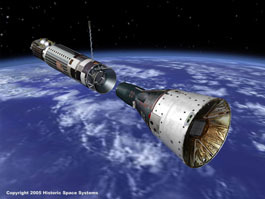 The Gemini VIII spacecraft modeled in the simulation. Note the black Velcro patches on the white adapter section. To aid space walking astronauts on the last four Gemini missions, these replaced the black thermal control stripes of earlier flights. 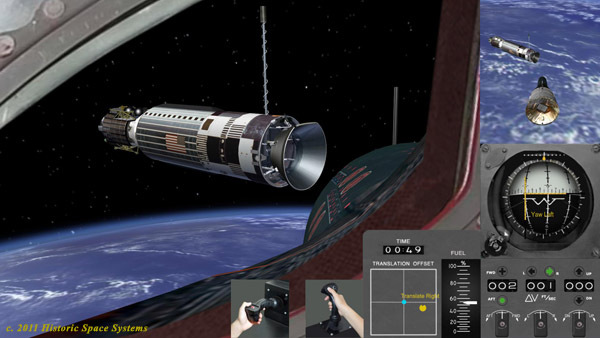 Views of the Gemini and Agena spacecraft modeled in the simulation. At top the Gemini fires thrusters to pitch down in preparation for docking. The Neil Armstrong Museum had approached Historic Space Systems for a new exhibit that would teach visitors about yaw, pitch, and roll. 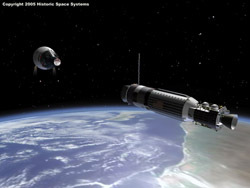 The concept quickly evolved into a simulation of docking techniques and skills based on the first docking in space. Neil Armstrong and David Scott performed the first docking in their Gemini VIII spacecraft on March 16, 1966. The simulation lasts about 3 minutes, which can be changed in the setup configuration. All images Copyright Historic Space Systems. To see how this simulation was made:. 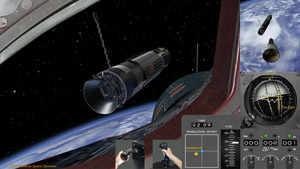 During the simulation, audio prompts from the co-pilot, labels on the gauges, and changing control handle images help the visitor maneuver the Gemini. We created this simulation with the same approach, the same passion for realism and historical accuracy, as in our high fidelity exhibits. 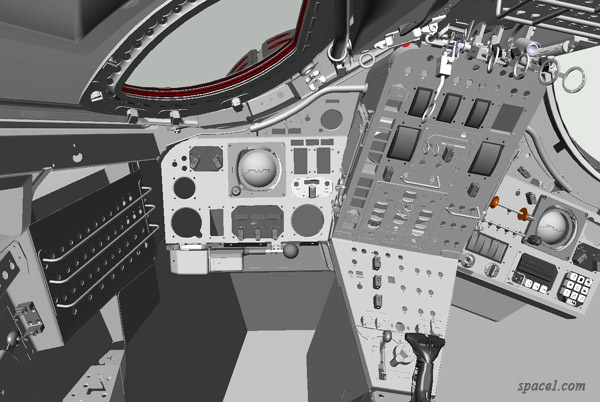 The simulation references over one hundred McDonnell Aircraft engineering drawings of the Gemini spacecraft and Agena Target Docking Adapter, and photographs from NASA and our own archives, to accurately depict the in-flight appearance of these spacecraft. At left, a computer model of the Gemini ejection seat design is under development as reference for a future Gemini simulator cockpit. Progress on the cockpit and control panel design can also be seen below. These designs are based on over 300 McDonnell Aircraft seat, hatch, and cockpit engineering drawings. 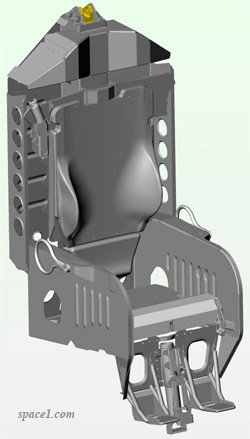 See labeled features of the Gemini ejection seat, and more images. Also get a closer look at the Gemini hatch. One concept for a Gemini simulator is shown at left. The left side of the cockpit accurately models the actual spacecraft, while the right side features a simple entry that allows wheel chair access. This arrangement is well suited for housing the docking simulation on the left side, and a spacewalk simulation on the right side.